Standard bails have a drop ring or opening so you can attach a jump ring, charm or pendant to a jewelry necklace chain or other stringing material. Standard bails are usually added to a necklace from the end either before or after affixing the clasp. Check to make sure the large bail opening will accomodate your chain or stringing material. 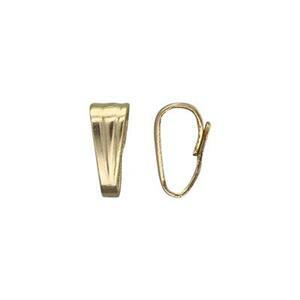 The drop ring should be large enough for your jump ring or other pendant attachment.